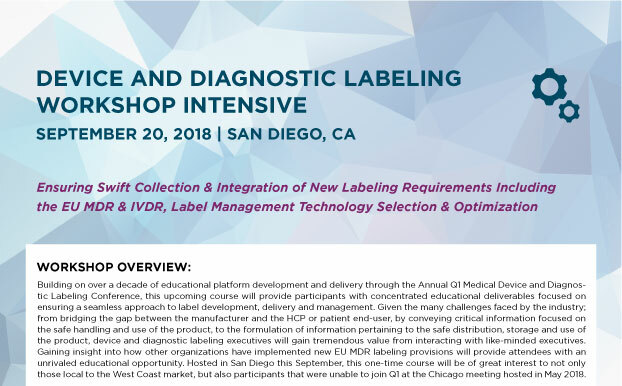 Building on over a decade of educational platform development and delivery through the Annual Q1 Medical Device and Diagnostic Labeling Conference, this upcoming course will provide participants with concentrated educational deliverables focused on ensuring a seamless approach to label development, delivery and management. Given the many challenges faced by the industry; from bridging the gap between the manufacturer and the HCP or patient end-user, by conveying critical information focused on the safe handling and use of the product, to the formulation of information pertaining to the safe distribution, storage and use of the product, device and diagnostic labeling executives will gain tremendous value from interacting with like-minded executives. Gaining insight into how other organizations have implemented new EU MDR labeling provisions will provide attendees with an unrivaled educational opportunity. Hosted in San Diego this September, this one-time course will be of great interest to not only those local to the West Coast market, but also participants that were unable to join Q1 at the Chicago meeting hosted in May 2018.